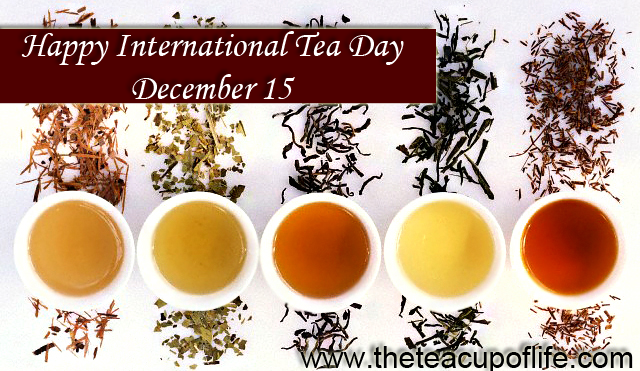 Today is International Tea Day which, on the surface, sounds like a day to celebrate tea drinking. We can, of course, and I will talk about tea consumption in a minute. 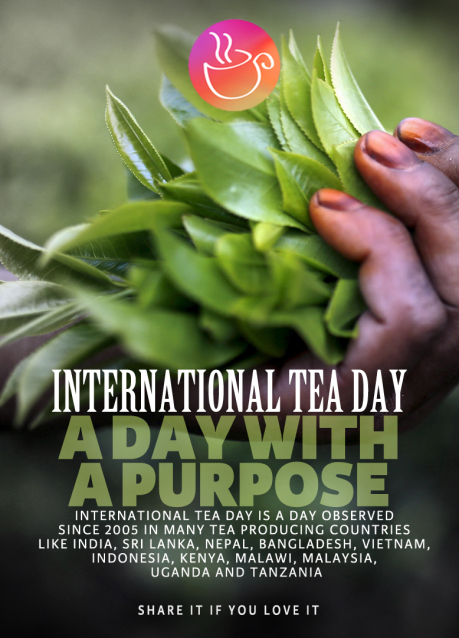 But the day was originally created as a way to raise awareness about the problems surrounding tea production and how tea plantations, small tea growers, and consumers are impacted by the global tea trade. 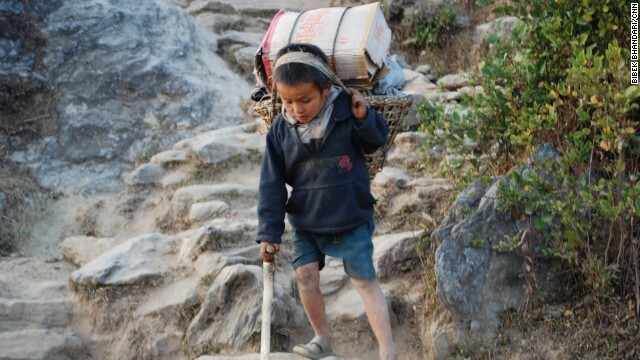 Simply put, global tea prices are too low to be able to provide workers worldwide with living wages and to prevent child labor without significant global regulation and monitoring. Potentially, therefore, if you drink tea and are not mindful of the source of your product, you may be contributing to world poverty. I have a very simple solution – I don’t drink tea (or coffee, which suffers from the same problems). If you do drink tea, one step forward is to ensure that your tea is produced in an ethical and sustainable way. The Fairtrade Foundation http://www.fairtrade.org.uk/en/what-is-fairtrade/who-we-are is one organization that can help you. What follows is largely drawn from their website. Since 2005, International Tea Day has officially been observed on 15 December, giving us an opportunity to reflect on the impact of an industry that millions of farmers and workers across the globe depend on for their livelihood. The tea sector faces many challenges: unsustainably low prices and wages, the undervaluing of tea as a commodity and changing climate patterns that impact yields, to name just a few. Simply put, tea is too cheap and not enough value goes back to the farmers and workers who depend on it for their living. It’s an issue that the whole industry needs to tackle together, and one that Fairtrade, and the Ethical Tea Partnership, which brings together tea producers, tea companies, certification schemes including Fairtrade, NGOs, and others in the tea industry, are working to address, so that the long-term future of the tea industry can be more sustainable. Fairtrade’s work in the tea sector aims to enable producers to have more control over their livelihoods. Certified producers receive the Fairtrade Minimum Price for their tea sales as well as the Fairtrade Premium, an extra sum to invest in their communities and businesses as they choose. For smallholder tea farmers, Fairtrade can also open up opportunities to develop knowledge in good agricultural practices, income diversification and climate change adaptation. For workers on tea plantations, Fairtrade Standards aim to ensure decent working conditions and the protection of workers’ rights. There are an estimated 285,000 people involved in Fairtrade tea production as smallholder farmers or as workers on Fairtrade certified tea plantations. 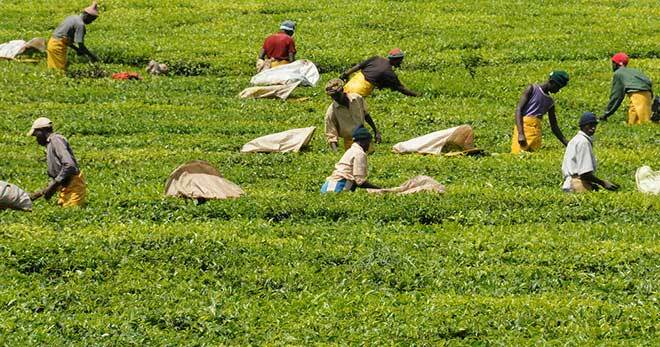 Kenya, one of the largest exporters of tea to the UK, has 117,000 of these producers alone. Sireet Outgrowers Empowerment Project Company (Sireet OEP), a small producer organization in the Nandi Hills region of Kenya, is an example. Sireet has been Fairtrade certified since 2006 and has been able to implement changes that have brought wide-reaching benefits for its members and their communities. Sireet OEP considers issues in production such as gender equality, fair business investments, and adapting to climate change. Since Fairtrade certification, the membership of women farmers has gone up from 2.7% to 24%. Investing the Fairtrade Premium on its certified products to support the purchase of transport trucks and its own processing factory has enabled the organization to move up the value chain and created a sustainable model of investment. The dividends from the 12.8% share of the factory purchased by the premium are reallocated into the premium fund each year, to be continually invested in social and environmental projects. These social projects are chosen by their communities and include a range of initiatives, from school bursaries to health care facilities and water tanks. These community investments not only relieve the immediate burdens but can also have a positive impact on household income of farmers. Workers on Fairtrade certified estates also benefit from Fairtrade Premium. Workers choose themselves how the premium money is spent, through a committee of elected worker representatives, putting the control in their hands to invest in projects that they feel will improve their lives. We have to face certain harsh realities, however. Certified tea estates are a small percentage of the total of tea producers, and the largest producer of tea by far – China – is not involved in fair trade at all. My way of solving the ethical dilemma – not drinking tea at all – is not really much of a solution. Tea workers need to live, and therefore need consumers. Better to buy only fair trade tea if you drink tea. Post-fermented: green tea that has been allowed to ferment/compost (called 黑茶 [hēichá] “black tea” in Chinese tea culture). One of the great linguistic mysteries of the world is the incredible simplicity of the words used for tea in a range of languages. Cognates of “cha” or “te” are virtually universal and ultimately derive from Chinese. The Chinese character for tea is 茶, originally written with an extra stroke as 荼 (pronounced tú), and acquired its current form during the Tang Dynasty. The word is pronounced differently in the different varieties of Chinese, such as chá in Mandarin, zo and dzo in Wu Chinese, and ta and te in Min Chinese. One suggestion is that the different pronunciations may have arisen from the different words for tea in ancient China, for example tú (荼) may have given rise to tê. 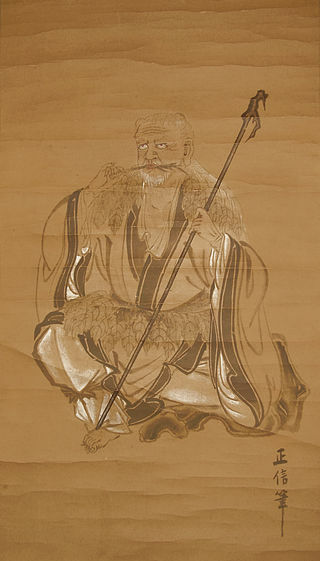 Historical phonologists however argue that cha, te and dzo all arose from the same root with a reconstructed pronunciation dra, which changed due to sound shift through the centuries. There were other ancient words for tea, though ming (茗) is the only other one still in common use. When I drank tea, lapsang souchong was my favorite. Lapsang souchong (立山小种lìshān xiǎo zhǒng) is a black tea originally from the Wuyi region of the Chinese province of Fujian. It is more commonly named 正山小种 – in Simplified Chinese characters, (zhèng shān xiǎo zhǒng) and 正山小種 in traditional Chinese characters. It is sometimes referred to as smoked tea (熏茶). Lapsang is distinct from all other types of tea because lapsang leaves are traditionally smoke-dried over pinewood fires, taking on a distinctive smoky flavor, that is an acquired taste for many. Whisk ½ cup granulated sugar and ½ tsp matcha in a small bowl. Set aside. Whisk the flour, baking soda, salt, and remaining 2 tablespoons of matcha in a medium bowl. Using an electric mixer on medium-high speed, beat the butter, brown sugar, honey, and remaining ¼ cup of granulated sugar in a medium bowl until light and fluffy, about 4 minutes. Add egg, egg yolk, and lemon zest and mix until very pale, about 4 minutes. Reduce the mixer speed to low and, with the motor running, add the flour mixture. Mix thoroughly until no dry spots remain. Using a wooden spoon or rubber spatula, mix in the white chocolate. Wrap the dough in plastic and chill at least 2 hours. Preheat oven to 350°F. Scoop the dough by the scant tablespoonful on to 2 parchment-lined baking sheets, spacing them about 1” apart. Or, portion the same amount of dough into the cups of a mini muffin pan coated with nonstick vegetable oil spray. Bake, rotating the baking sheet halfway through, until the bottoms and edges are barely golden and cooked (top will no longer look wet), 8–10 minutes. 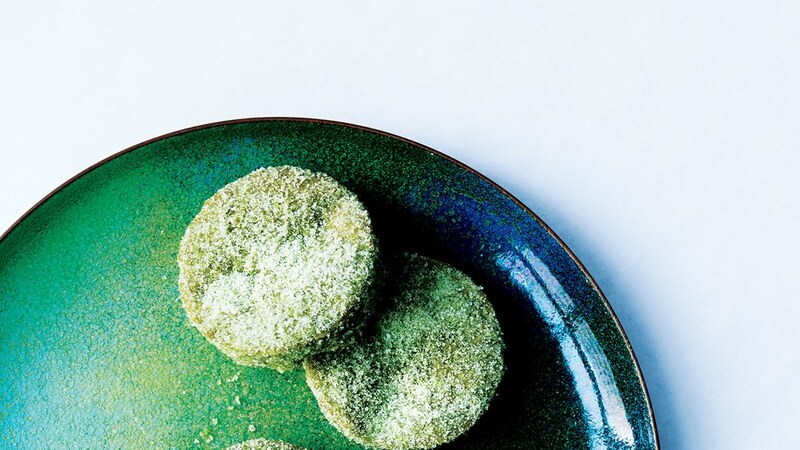 Immediately—but gently—toss the biscuits in the reserved matcha sugar and place on wire racks to cool.